High-quality radiographs are essential in diagnosing pathology of the jaw. When appropriate radiographs are not submitted to the pathologist along with a biopsy specimen, misdiagnosis and mismanagement may occur. In this case study, we highlight the complementary value of panoramic and intraoral radiographs in allowing a definitive diagnosis of a mixed lesion of the jaw and preventing inappropriate treatment. Although many general dental practitioners tend to refer potential bony pathology, they should acquire and communicate high-quality radiographic information to specialty providers so that a precise diagnosis can be made. A healthy, 19 year old presented to his dentist with a slowly progressive, asymmetric swelling of the right mandible. He reported no history of trauma to the area, pain or paresthesia. The teeth in the region were vital and no mobility was observed. Extraoral examination showed subtle deformation of the right cheek overlying the mandible. A panoramic radiograph revealed a lesion affecting the right mandible. The patient was provided with a photocopy of the radiograph and was referred to an oral surgeon for diagnosis and treatment. The oral surgeon took an incisional biopsy at the periphery of the superficial aspect of the lesion and sent the specimen to a local pathology laboratory. After initial examination, the pathologist’s differential diagnosis was fibrous dysplasia or ossifying fibroma. In part because of the sharply demarcated radiographic appearance, ossifying fibroma was favoured, but a second opinion was sought from our laboratory. Because of the poor quality of the paper copy of the panoramic radiograph, we requested the original digital film from the patient’s dentist (Fig. 1). It revealed a prominent mixed radiolucent/radiopaque expansile mass affecting the right mid-body of the mandible. The borders appeared well defined in most areas but blurred in the anterior region and along a smoothly expanded inferior cortex. The centre of the lesion showed an increased density of bony trabeculae with 2 distinct large radiodense areas. A hint of root resorption of teeth 45 and 46 was also observed but there was no evidence of tooth displacement. Figure 1: Panoramic radiograph showing expansile mass in the right mandible. The histologic slide contained a small specimen, which we interpreted as a “benign fibro-osseous lesion,” and we agreed with the referring pathologist that the most likely diagnosis was either fibrous dysplasia or central ossifying fibroma. Because the treatment for fibrous dysplasia often involves surgical management only after growth is complete,1 whereas the treatment for ossifying fibroma is complete removal as early as possible,2 precise characterization was vital. Although a larger biopsy specimen may have been helpful, additional radiographic information was essential for reaching a final diagnosis. Intraoral radiographs had not been taken initially; however, on request, the patient’s dentist obtained periapical (Figs. 2 and 3) and occlusal (Fig. 4) films. Figure 2: Periapical radiograph of teeth 44–46 showing “ground glass” appearance of the lesion. Figure 3: Periapical radiograph of teeth 45–48 showing an indistinct and blending superior and posterior border. Figure 4: Occlusal radiograph of teeth 45–47 showing incorporation of the buccal and lingual cortices into the affected bone. Although the panoramic radiograph seemed to indicate a well-circumscribed border, the periapical and occlusal radiographs clearly showed lesional tissue blending gradually with the surrounding normal bone, with complete incorporation of the buccal cortex. The tooth roots were not resorbed as suggested on the panoramic radiograph, but there was loss of lamina dura. The internal structure of the lesional bone showed classic “ground glass” architecture. These radiographic findings clearly identified the lesion as fibrous dysplasia rather than ossifying fibroma.2-4 Based on the preliminary diagnosis of ossifying fibroma, the surgeon had been planning to remove the lesion, according to established treatment standards for this benign tumour.2 This could have led to tooth devitalization and nerve injury. The patient was thus spared an unnecessary excision and potential negative outcomes. Making an accurate diagnosis of lesions affecting the bones, including the jaws, requires correlative assessment of clinical, radiographic and histologic findings.2,3,5 This is particularly true when a mixed radiolucent/radiopaque lesion is encountered. Insufficient radiographic information may lead to misdiagnosis and improper treatment. Analysis of this case leads to recommendations to acquire and communicate radiographic information that can prevent misdiagnoses in the future. Guidelines for radiographic examination from both the Canadian Dental Association and the American Dental Association indicate that radiographs are justified for acquiring information that will assist in diagnosis or treatment.6,7 Justifiably, there is no specific recommendation for pathology-related complaints, as clinical judgment is needed to assess which radiographs are necessary to diagnose the wide variety of disease presentations that can occur in the jaws. Good clinical judgment is based on the interpretation of the clinical history to form a reasonable differential diagnosis and then ordering appropriate radiographs that will help narrow the field. Although a thorough workup of the differential diagnosis of jaw pathology may be deferred to a specialist, a few simple concepts can guide the general dentist to acquiring and communicating appropriate radiographic information so that an accurate diagnosis can be made. Although advanced imaging techniques (i.e., computed tomography, cone-beam computed tomography) are certainly warranted to assist in the diagnosis and treatment of jaw pathology, this discussion focuses on the value of radiographs readily available in the general dentistry setting. First, acquire a radiograph that captures the lesion in its entirety. Panoramic radiography, which is well suited for showing the nature and extent of disease,8 was appropriately used in this case to depict the entire area of swelling. Next, review all available radiographs to determine whether more are needed.9 Critical evaluation of the panoramic radiograph yields essential information that indicates the next most appropriate radiographs to order to help reach a final diagnosis. Two of the steps in radiographic interpretation outlined by White and Pharoah10 are particularly applicable in this case: assess the periphery (borders) and analyze the internal structure. In a mixed lesion of the jaws, assessment of the borders and internal structure is critical to the diagnosis.3,4 Thus, high-quality radiographs showing these 2 features should be obtained. The panoramic radiograph (Fig. 1) clearly showed a solitary mixed lesion containing both radiolucent and radiopaque components; however, the borders appeared well defined in some areas and ill defined in others. In addition, the internal structure was altered, but not clearly visible in this film. 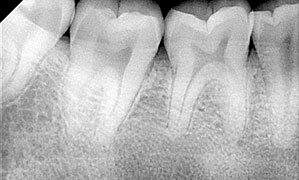 This highlights some limitations of panoramic radiography (i.e., lower resolution, magnification/distortion) compared with intraoral radiographs.10,11 Because the lesion approximated the periapical region of multiple teeth, the simplest and least expensive approach to overcoming the limitations of the panoramic radiograph was the addition of intraoral radiographs. Although there is some conflicting evidence on the utility of periapical radiographs versus a panoramic radiograph for diagnosing radiolucent periapical pathology,12,13 in the diagnosis of periapical sclerotic lesions, periapical radiography is superior.14 More important, high diagnostic sensitivity and specificity result when a panoramic radiograph and periapical radiographs are combined.15 In this case, intraoral radiographs provided the resolution needed to characterize the borders and internal structure of the lesion accurately. This could have led to a strong presumptive diagnosis of fibrous dysplasia rather than ossifying fibroma4 even before the biopsy was taken. Finally, even when appropriate radiographs are taken, their diagnostic value is meaningless if the information they contain is not accurately communicated to the specialist. The quickest, least expensive and unfortunately common approach is to make a “copy” of the radiograph on regular copy paper and forward that to the pathologist. The results are often of poor quality and non-diagnostic. Although inkjet printouts on glossy16 or satin paper are of similar subjective quality to a digital image on a monitor, a significant loss of quality occurs if the images are printed on matte paper.17 That was the situation in the case described here and is common practice in our experience. Submission of high-quality prints or electronic transmission is thus preferred to communicate important radiologic information to the specialist rendering a final diagnosis. Although direct referral to a specialist is often preferred for uncommon pathology of the jaw, dentists can greatly contribute to an accurate diagnosis. Suggestions for taking appropriate radiographs include: capture the entire lesion, take films that show good resolution of the borders and internal structure of the lesion and use the complementary value of panoramic radiography and intraoral films. Once appropriate radiographs have been acquired, they should be transmitted with high fidelity to specialty providers. This approach will greatly aid in making precise diagnoses and preventing inadequate or excessive treatment. Dr. Shumway is an assistant professor in the department of surgical and hospital dentistry, University of Louisville School of Dentistry, Louisville, Kentucky. Dr. Foster maintains a private practice in general dentistry in Nashville, Tennessee. Kusano T, Hirabayashi S, Eguchi T, Sugawara Y. Treatment strategies for fibrous dysplasia. J Craniofac Surg. 2009;20(3):768-70. Eversole R, Su L, ElMofty S. Benign fibro-osseous lesions of the craniofacial complex. A review. Head Neck Pathol. 2008;2(3):177-202. Epub 208 May 13. Bernaerts A, Vanhoenacker FM, Hintjens J, Chapelle K, Salgado R, De Foer B, et al. Tumors and tumor-like lesions of the jaw mixed and radiopaque lesions. JBR-BTR. 2006;89(2):91-9. MacDonald-Jankowski DS. Fibro-osseous lesions of the face and jaws. Clin Radiol. 2004;59(1):11-25. Klein MJ. Radiographic correlation in orthopedic pathology. Adv Anat Pathol. 2005;12(4):155-79. Canadian Dental Association. CDA position on control of x-radiation in dentistry. Feb. 2005. Available: www.cda-adc.ca/_files/position_statements/xradiation.pdf (accessed 2011 Sept. 14). American Dental Association and U.S. Department of Health and Human Services. The selection of patients for dental radiographic examinations. 2004 (rev.). Available: www.ada.org/sections/professionalResources/pdfs/topics_radiography_examinations.pdf (accessed 2011 Sept. 14). Molander B. Panoramic radiography in dental diagnostics. Swed Dent J Suppl. 1996;119:1-26. White SC, Heslop EW, Hollender LG, Mosier KM, Ruprecht A, Shrout MK, et al. Parameters of radiologic care: an official report of the American Academy of Oral and Maxillofacial Radiology. Oral Surg Oral Med Oral Pathol Oral Radiol Endod. 2001;91(5):498-511. White SC, Pharoah MJ. Guidelines for prescribing dental radiographs. In: Oral Radiology. Principles and Interpretation. 5th ed. St. Louis: Mosby; 2004. p. 265-77. Vandenberghe B, Jacobs R, Bosmans H. Modern dental imaging: a review of the current technology and clinical applications in dental practice. Eur Radiol. 2010;20(11):2637-55. Epub 2010 Jun 11. Rohlin M, Kullendorff B, Ahlqwist M, Stenström B. Observer performance in the assessment of periapical pathology: a comparison of panoramic with periapical radiography. Dentomaxillofac Radiol. 1991;20(3):127-31. Molander B, Ahlqwist M, Gröndahl HG, Hollender L. Comparison of panoramic and intraoral radiography for the diagnosis of caries and periapical pathology. Dentomaxillofac Radiol. 1993;22(1):28-32. Rohlin M, Kullendorff B, Ahlqwist M, Henrikson CO, Hollender L, Stenström B. Comparison between panoramic and periapical radiography in the diagnosis of periapical bone lesions. Dentomaxillofac Radiol. 1989;18(4):151-5. Molander B, Ahlqwist M, Gröndahl HG. Panoramic and restrictive intraoral radiography in comprehensive oral radiographic diagnosis. Eur J Oral Sci. 1995;103(4):191-8. Benediktsdóttir IS, Wenzel A. Accuracy of digital panoramic images displayed on monitor, glossy paper, and film for assessment of mandibular third molars. Oral Surg Oral Med Oral Pathol Oral Radiol Endod. 2004;98(2):217-22. Gijbels F, Sanderink G, Pauwels H, Jacobs R. Subjective image quality of digital panoramic radiographs displayed on monitor and printed on various hardcopy media. Clin Oral Investig. 2004;8(1):25-9. Epub 2003 Dec 2.